Local business – it’s the forefront of our economy, it’s were community meets business. Unfortunately, the internet boom has caused many brick and mortar local businesses to lose significant market share. In this blog article, I will share with you some great tips to running a successful local area marketing campaign using Facebook advertising (all for much less than you would pay for a local newspaper ad). First though, let’s look at how local businesses have traditionally marketed their business. Letterbox drops: While these can be effective, they are not highly targeted and the cost to print and deliver them starts to add up. Referrals and Word of Mouth: Ideally the best way to grow a customer base; however, you can’t always control how much business you generate from this source. Ok, let’s look at the facts! If you were to walk the streets and ask every person if they had a Facebook account, I can assure you 85% of them would say they do. This is where your potential customers are socialising. Treat Facebook as the modern day equivalent of a networking event. Now that we understand that Facebook is a great medium to find new customers (especially for Local Area Marketing), here is how we do it. 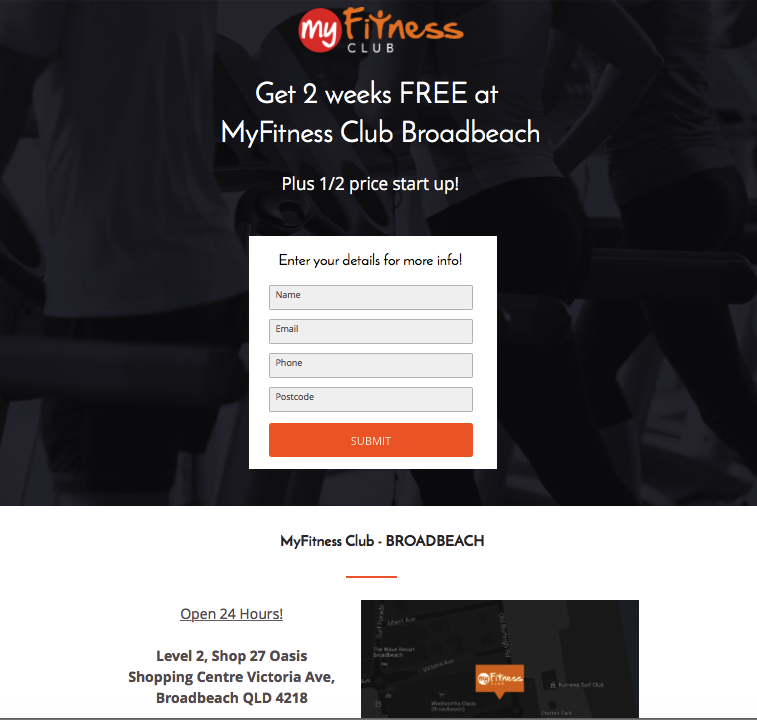 I am going to use one of our clients – My Fitness Club – who have fitness gyms on both the Gold Coast and Sunshine Coast in Queensland. We recognised that the majority of people that attend a gym live within 10 km of the location, otherwise they don’t go. Facebook allows us to target a radius around the location of that gym to ensure it is only showing our ads to potential customers located within that area. This is why Facebook is the obvious choice when it comes to Local Area Marketing. Once we have our target, we then create multiple different ads using varying imagery to see which works best. The next step is VERY, VERY IMPORTANT! Instead of just sending leads generated by ads to the client’s website, we direct them to a customised landing page. This allows us to mate the ad offer with the website, which increase the chances of getting their details. In this case, the offer was a free 2 week trial. This strategy produced a 12.5% conversion rate. For anyone that actively tracks their conversion rate on their website, will know that anything over 3-4% is considered a win. 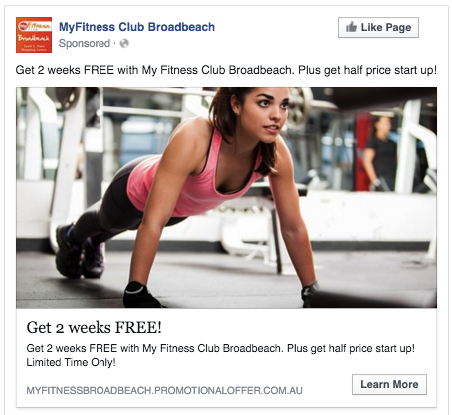 One thing to note is that you don’t need a massive budget to run a successful Facebook Advertising campaign. At LBD, we recommend a minimum budget of $600 per month in advertising spend (which works out to roughly $20 per day). It’s time to take action! 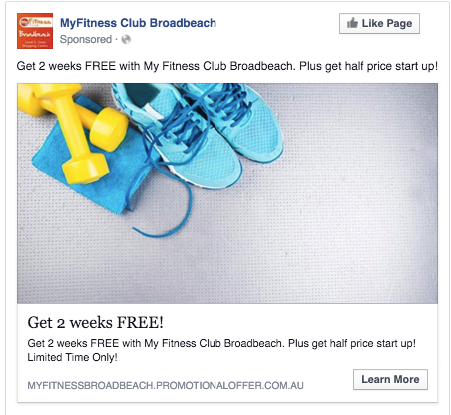 Start a Facebook Advertising campaign with LBD Marketing today or call (02) 8915 6229 for more information. or call us now on (02) 8915 6229 to discuss your project.